Please find enclosed the certification for the pieces you purchased during my last promotion. I must apologise for the delay in getting them out to you but I’ve hardly been home since then. In fact I’m off again next week having just got back from Iran and Pakistan. I would have to say that despite the strikes and the riots, the heat, the lack of sleep and being bumped off a flight in the middle of nowhere resulting in a cheap but hair-raising 12 hour taxi ride this is the best trip I’ve ever had. I loved every minute of it. The only regret is that the body isn’t 20 years younger to better cope with the rigours of travel in this part of the world. The truth is, however, that 20 years ago I had neither the patience nor the mental agility to just accept whatever situations arose, trusting that in the end everything works towards the good. One night in Iran for example my agent and I found ourselves stranded in a little village in Qashqai territory outside Shiraz; despite our best efforts we had no way of getting out until the following day. Seeing our plight, a couple of villagers whom I had bought Gabbehs from earlier in the day offered us accommodation for the night. Their homes, they explained with some embarrassment, were rather small so my agent went with one family and I went to the other. Now I don’t speak Farsi and my host had no English and it was obvious that we had both concluded that without my agent translating for us there was plenty of potential for a stressful night. When he introduced me to his family, especially the women of the house, I realised that my host wasn’t just putting me up out of any sense of obligation but from a genuine heart-felt response to my need and he was doing everything he could to put me at ease. I could only do the same. Our evening was hilarious. As food was set before us I put my vegetarian preferences on hold for the night and just “enjoyed” what was offered. My host, God bless him, spent most of the meal time explaining to me what was in the various dishes by doing animal impressions of the main ingredient. And the ‘headless chicken dance’, while it had us all in hysterics, also reaffirmed my attachment to a meatless diet. The rest of the night was spent in conversation of sorts using sign language, charades and whatever tourist phrase-book lines that came to mind. Mostly we spoke of family, our hopes and expectations and of course the trials and tribulations of the carpet business. It gradually dawned on me that despite the great differences between our cultures and traditions this lovely man, a Qashqai Muslim living in a tiny house in the barren lands of south-west Iran was no different to me. He was doing the best he could with what he knew, in the best way possible to meet his needs and those of his family. My night with this man and his family turned out to be the perfect finish to a perfect day. Isn’t this a wonderful way to make a living? 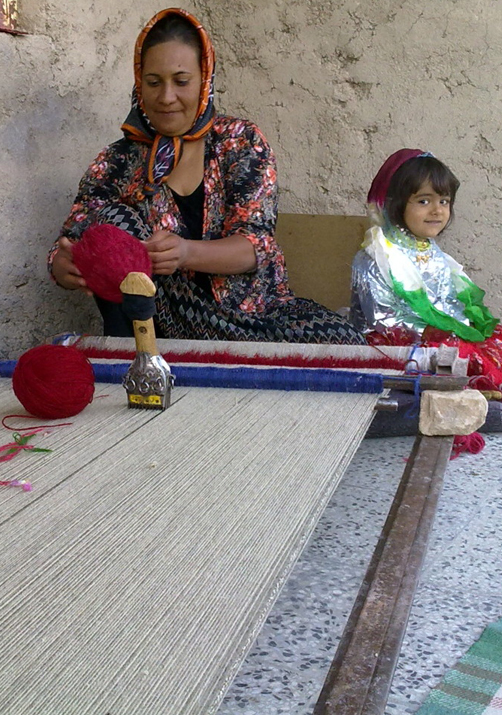 QASHQAI WEAVER ,FARS. Courtesy Anna Williams.